Happy 2019 to you all. May this year be a great one for each of you and may you achieve all the goals that you have set for yourselves. There is a lot of information below to help you keep chipping away at your Greek. Use whatever you need, when you need it or simply use the email as a reminder for the week ahead. Try memorising the following verse during this month and look out for a new one each month. John 3:16 (NA28) — 16 οὕτως γὰρ ἠγάπησεν ὁ θεὸς τὸν κόσμον, ὥστε τὸν υἱὸν τὸν μονογενῆ ἔδωκεν, ἵνα πᾶς ὁ πιστεύων εἰς αὐτὸν μὴ ἀπόληται ἀλλʼ ἔχῃ ζωὴν αἰώνιον. John 3:16 (ESV) — 16 “For God so loved the world, that he gave his only Son, that whoever believes in him should not perish but have eternal life. An option I prefer, is to use his handy app with notifications. You can download it free for iOS or Android. An important part of growing in any language is vocabulary acquisition. 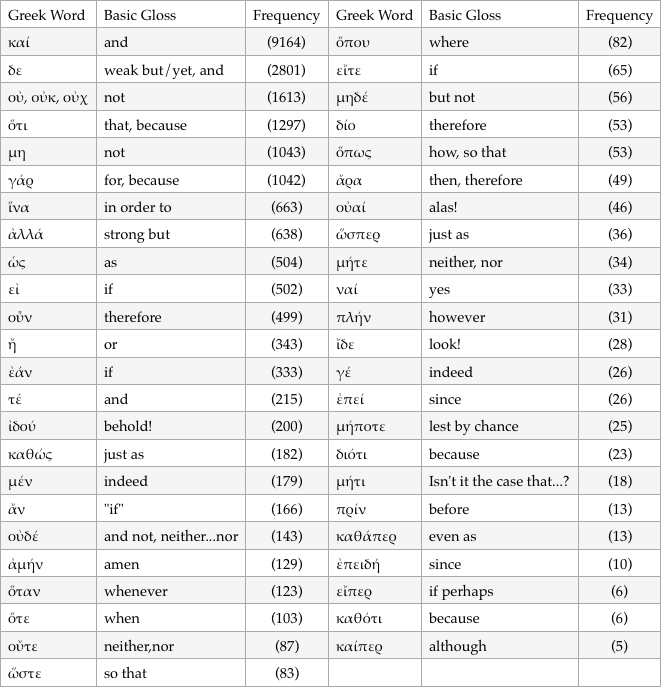 To assist with this, I have created the following Quizlet sets for various word frequencies. Simply, take the time to open up one of the links and test yourself. Why not take a few minutes each day to go through one list? Note: All the data has been taken from Accordance Bible Software. The Quizlet app can be downloaded for free on your phone. Matthew 24:17–26 (ESV) — 17 Let the one who is on the housetop not go down to take what is in his house, 18 and let the one who is in the field not turn back to take his cloak. 19 And alas for women who are pregnant and for those who are nursing infants in those days! 20 Pray that your flight may not be in winter or on a Sabbath. 21 For then there will be great tribulation, such as has not been from the beginning of the world until now, no, and never will be. 22 And if those days had not been cut short, no human being would be saved. But for the sake of the elect those days will be cut short. 23 Then if anyone says to you, ‘Look, here is the Christ!’ or ‘There he is!’ do not believe it. 24 For false christs and false prophets will arise and perform great signs and wonders, so as to lead astray, if possible, even the elect. 25 See, I have told you beforehand. 26 So, if they say to you, ‘Look, he is in the wilderness,’ do not go out. If they say, ‘Look, he is in the inner rooms,’ do not believe it. 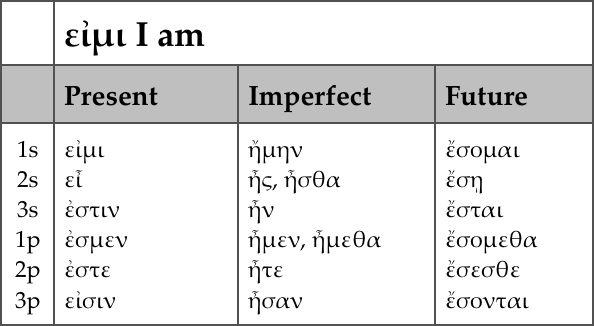 Below you can keep your Greek fit by reciting foundational aspects of the language. Write out or recite the Article. Write out or recite the paradigm for the verb I am. Notes: The [3 1c 3] key is how they decline i.e., 3rd declension, 1st declension, 3rd declension. 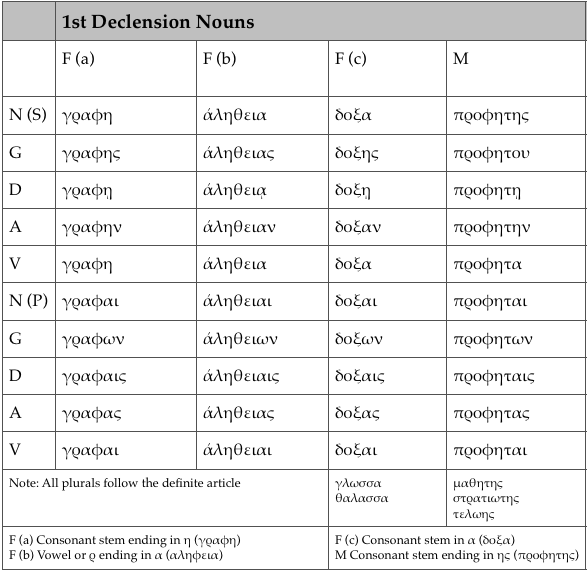 The 1st declension follows the standard grammatical pattern. (1a) Consonant stem ending in η as in γραφη. 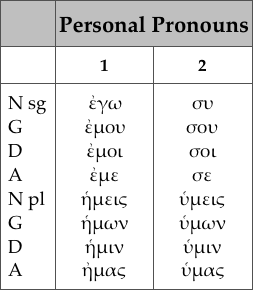 (1b) Vowel or ρ ending in α as in αληφεια. (1c) Consonant stem in α as in δοξα.